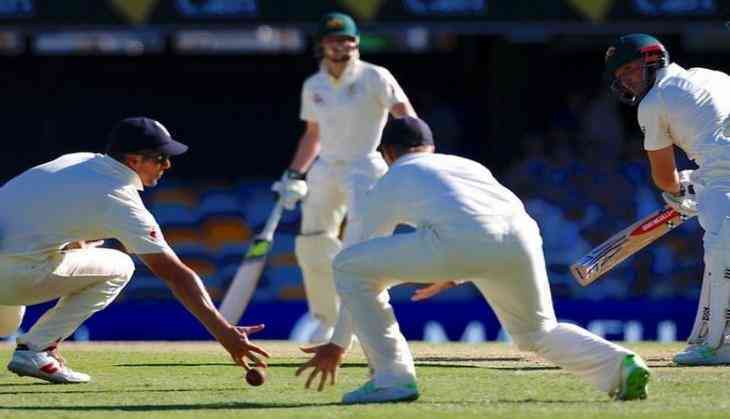 England bowlers presented a formidable show as Australia came to bat in the first innings of the first Test of the Ashes Series, to overcome the shortcomings of their batsman on 24 November morning here at the Gabba. On the opening day of the first Ashes Test, England met Australian fighting talk with quiet defiance and scored 196-4 with the help of a spectacular show put up by under-rated James Vince. On the first morning of the Ashes, Vince proved himself as the "in-vince-able" by scoring 83 and showed that his selection was worth a risk. Vince produced a spectacular partnership of 125 runs with Mark Stoneman 83 for on Day 1 to give England a strong start. However, the momentum swung to the Australian side on Day 2 as England tumbled from 246 for 4 to 302 all out in a harum-scarum display. Dawid Malan, who resumed the day on 28, was dismissed for 56, whereas Moeen Ali succumbed to Nathon Lyon at 38. Mitchell Starc and Pat Cummins took three wickets each for the team in first innings, whereas Lyon settled for two. From the Australian side, Cameron Bancroft and David Warner came as openers. England got its first breakthrough very soon with Bancroft, who was dismissed for a cheap five. At tea, Australia were batting at 76-3 and trailing England by 226 runs with 7 wickets remaining and Smith (19), Peter Handscomb (14) on crease.